Banjul, The Gambia, Tuesday 19 February 2019 – His Excellency President Julius Maada Bio and First Lady Fatima Bio have arrived at the Banjul International Airport to start a three (3) day state visit to the Gambia on the invitation of His Excellency President Adama Barrow and his First Lady, Madam Fatoumatta Bah Barrow. At the Banjul International Airport, President Bio and Madam Fatima Bio were received by President Barrow and Mrs Barrow with pomp and pageantry. The colourful atmosphere at the airport demonstrated that His Excellency President Adama Barrow was receiving his brother and a great ally not just in the subregion but also in the continent. Outside the airport, His Excellency President Julius Maada Bio and Madam Fatima Bio were greeted by throngs of excited Sierra Leoneans. As a sign of appreciation for the people, both Presidents Bio and Barrow came out of the car roof waving to the jubilant crowd as the presidential motorcade passed by. It was spontaneous and showed two Presidents who are not only popular with ordinary people but also two politicians who care deeply for ordinary people. Also, there were smiles and great sisterly affection between the two First Ladies at the Banjul International Airport. For Mrs Fatima Bio, The Gambia is like “home away from home”. The First Lady of the Republic of Sierra Leone is a true symbolism of the long and rich history between Sierra Leone and the Gambia; a product of both cultures and fluent in languages shared by both countries. This state visit is symbolic as it is the maiden state visit to The Gambia for both President Bio and First Lady Fatima Bio since Bio’s election as President. Later tonight, His Excellency the President of the Republic of The Gambia and Madam Fatoumatta Bah Barrow will host a State Banquet in honour of His Excellency President Julius Maada Bio and wife, Her Excellency Fatima Bio. On Wednesday, both President Bio and President Barrow will hold a bilateral meeting at the State House and that will be followed by a joint Press Briefing with both Heads of State. On Wednesday evening, His Excellency President Julius Maada Bio will also meet with the members of the Sierra Leone Community in the Gambia. Keeping true to her passion for healthcare, on Thursday Her Excellency Madam Fatima Bio will visit the Edward Francis Teaching Hospital where she will be received by her sister, Her Excellency Madam Fatoumatta Bah Barrow, First Lady of the Republic of the Gambia. Later in the day, Madam Fatima Bio will be hosted to a Lunch by the First Lady of the Republic of Gambia. 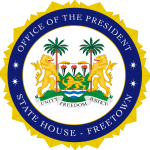 His Excellency President Julius Maada Bio is also scheduled to visit the Sierra Leone High Commission to climax the State Visit. President Bio has been accompanied by the Chief Minister, Professor David J. Francis, Deputy Minister of Foreign Affairs and International Cooperation, Mrs Nimatulai Bah-Chang, Head of Strategic Communications, Dr. Patrick K. Muana and the Press Secretary and Presidential Spokesman, Yusuf Keketoma Sandi. President Bio is expected to return to Sierra Leone on Friday 22nd February 2019.